A joint venture design collaboration of Bohlin Cywinski Jackson and Bassetti Architects culminated with the final design that offered functionality, space needs for the mayor and city council, public gathering space, reception and citizen services. Community input was not only encouraged it was used to help develop the final design. The design also included as many LEED™ building techniques as possible. The design considerations offered by the community, the goal to incorporate the Seattle style, care for the environment and an approachable government all helped steer the final design. 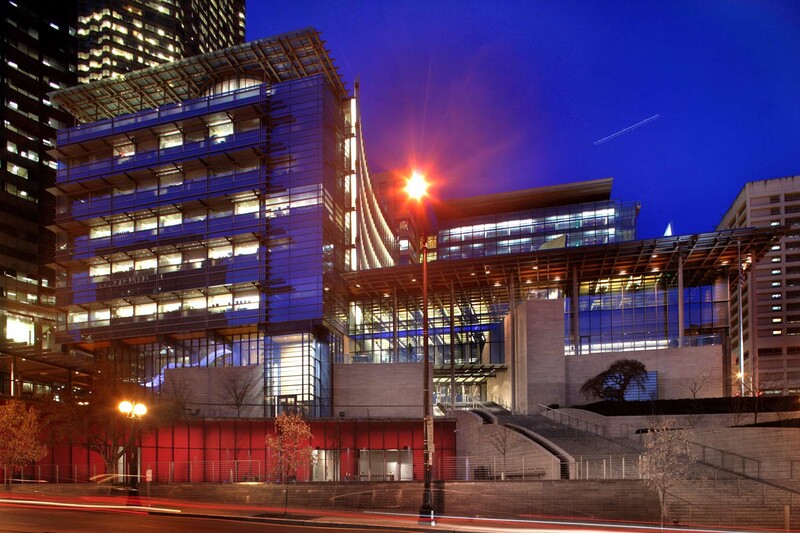 The joint venture effort proved to be very successful with the addition of such a compelling building to the Seattle Civic Center Campus. It is truly one that the community can be proud of. The structure consists of 200,000 square feet of offices, open spaces and conference areas all connected by a large open floor plan on the first floor. Due to the severe slope of the site the design included a large grand staircase that begins at the second floor and continues to the bottom of the grade a city block away. A gentle flowing river runs through the first floor lobby, follows the stairs and the slope of the site, turning into a waterfall that carries the water to the edge of the project site. This water feature is intended to be an extension of the water feature at the Justice Center across the street. The inviting open plaza outside was designed to be one that the public would utilize for art displays, gatherings or even just space to enjoy a good book or hot cup of coffee. It includes large raised planting areas, a water feature in a play area with water poppers and a scrim wall. It is all defined by the vibrant red glass wall that is the backdrop to the water feature. The final design included mechanically anchored stone veneer, mortar laid up cubic walls, cubic carved columns, cubic wall caps, cubic water feature, mortar set paving, mortar set stair treads and risers, mortar set water feature and cubic benches. 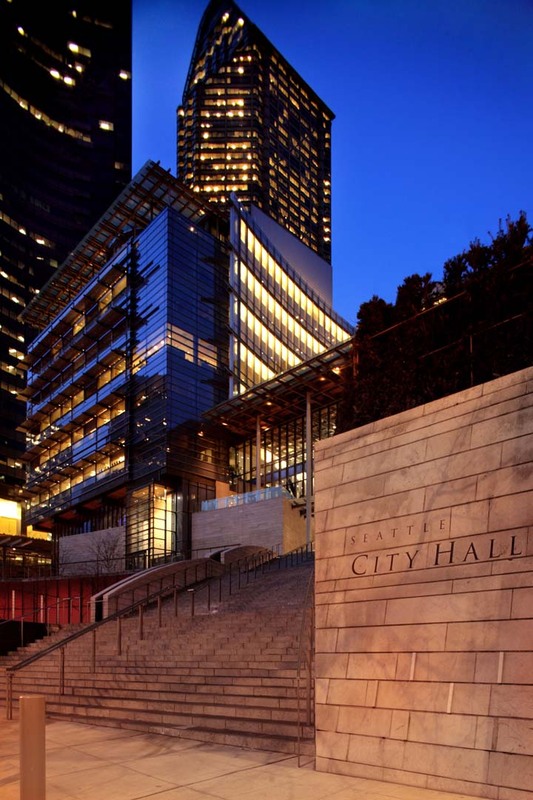 The Seattle City Hall project utilized all facets of stone installation that resulted in a very challenging and rewarding project. The amount of open space that was retained became user friendly and, by the use of stone, long lasting. 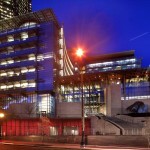 The Seattle City Hall project was another successful portion of the Seattle Civic Center Campus.